The softer version of the military-style obstacle course Tough Mudder is set to take place on Randall’s Island on July 25, 2015, organizers said. 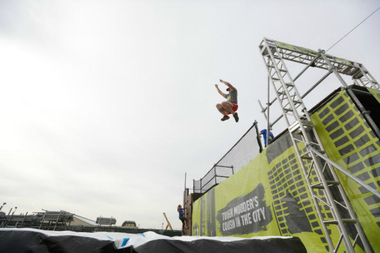 HARLEM — Urban Mudder, a softer version of Tough Mudder — without mud, electricity and swimming — is set to take place on Randall’s Island this summer, Tough Mudder Company announced Tuesday. “We’re replacing mud and electricity with 5 miles of music, the most innovative obstacles you’ve ever seen, and a day long festival,” the company said. Presented as “Tough Mudder’s cousin,” the scaled-back team competition will take place on July 25 and will come with food trucks, music and a beer garden. Unlike Tough Mudder courses that have participants plunging into freezing water, jumping through a ring of fire and sometimes even facing tear gas, the 5-mile race will feature somewhat easier challenges. The dozens of obstacles planned so far include leaping between rooftops 20 feet up in the air, going through a laser minefield without breaking the beams, swinging from a trapeze and pushing yourself up between two brick walls to get to a shallow pit, according to the race website. There will also be three water stations, organizers said. Unlike the 10- to 12-mile Tough Mudder military-style obstacle course, participants do not need to be "super athletes" to take part in this race, Tough Mudder said. "If you exercise at least once or twice a week, you will be able to make it around the course with the help of your team. It might not always be pretty, but you’ll get around," organizers wrote on the event's website. Participants (who have to be at least 16 years old) can already register online with ticket prices starting at $90. The average team consists of four people but there is no team size limit, the company said.